* Rear Axles: 44,000 lb. * Capacity: 60,000 or 75,000 lbs. * Tilt Frame:8” x 4” x 1ž2” Structural Tubing Outside Rail Configuration: 35” O.D. * Operating Pressure: 2,000 P.S.I. Max. * Dump Angle: 49 deg. 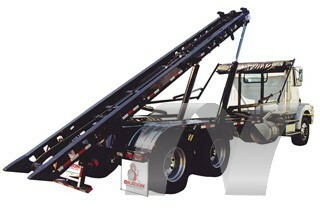 * Available as a “Ship-Out” complete unit or Factory Installed at one of our locations.